A Kansas city councilman isn't backing down following a controversial image he shared recently on his personal Facebook page. "It was hilarious," Rich Melton said. "I think the funniest part was, I don't think it would have been near as funny if the Cheeto wasn't on there." 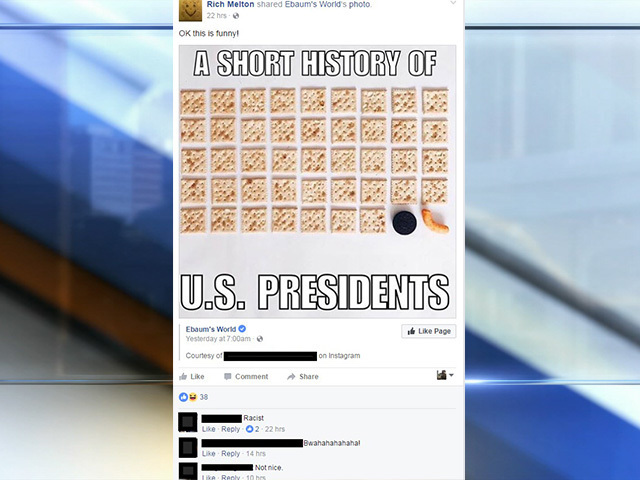 The Gardner, Kan. city councilman recently shared this picture on his Facebook page comparing the U.S. presidents to food — the 44th being a cream-filled chocolate cookie. Some in Gardner found the post offensive and racist. "The people who know me and know what we're doing are going to look at this and go, 'This is the most ridiculous thing ever,'" said Melton. But some didn't think it was ridiculous. One comment below the image referred to it as racist, but others didn't see it that way. "Yeah, it's funny," laughed one woman after being shown the image. "That's a little disturbing to me," said another woman. "That's not cool at all," said a young father just minutes later. While the City of Gardner has a social media policy and rules of procedure in place for our Governing Body, elected officials are exempt from disciplinary action by the city in regards to personal social media posts. Our organization does not condone the post in question, as it does not align with the values of our community. In Gardner, our focus is to continue to build and nurture our city and our residents, while providing a high quality of life inside a vibrant and rapidly growing community. But Melton still isn't apologizing to those who feel the post is racially insensitive. "One, that's their opinion. In my opinion it wasn't. It was just funny," he said. And the man, who doesn't consider himself a politician, feels this post from his personal page was only red flagged because of his local political agenda. "This is totally bologna and even my black friends didn't go 'Rich, that's racist.' Ok," said Melton. And even though Melton admits the post would be inappropriate on his city councilman page, he doesn't plan to take the post down from his personal page. "Yeah. I'm not gonna take it down. That's my personal page," said Melton. "if you don't like it, unfriend me. I don't care."